A simple yet powerful platform that dramatically improves workplace effectiveness through better relationships and measurable behaviour change. We believe in the powerful combination of authentic conversation, technology, and insight-driven data. At LeadershipMind, we don’t just talk about behavioral change—we track it using our Actionable Conversations™ platform. Through our partnership with Actionable Conversations – an innovative platform in the learning & development space that dramatically improves workplace effectiveness through behavior change, for the leader, team members & the organization. LeadershipMind Consulting can customize a development solution for your organization by leveraging over 40 Actionable Conversations. Just 13% of all employees are engaged at work. *Gallup 2013 study on the State of the Global Workplace looked at employee engagement in 142 different countries. The good news is that you can improve engagement much more easily and much more affordably than you ever imagined. Engagement is about relationship. It’s about the connection your employees have with you, with each other and with the work and values of you company. Effective working relationships is the secret ingredient that distinguishes successful companies from ones that struggle with constant re-orgs, employee turnover, absenteeism, and failed goals. Studies show that the main reason employees leave organizations is dissatisfaction with the relationship with their manager and/or their peers. You can do something about that. 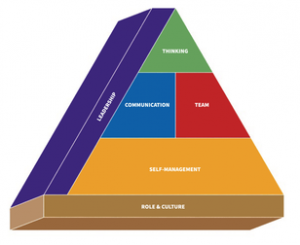 We can help you have better and more frequent conversations with your peers and employees. Higher engagement = better business results. Watch Actionable founder Chris Taylor break it down in this video. 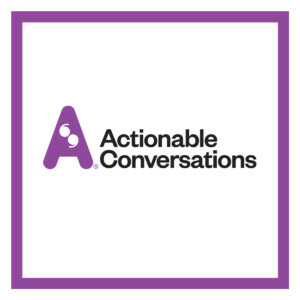 Actionable Conversations™ focus on these six core principles and allows you to choose sessions that specifically address your team’s unique workplace challenges and areas for growth within the six competencies on the pyramid. Take a tour of how the actionable process works. Interested in trying out an actionable conversation with your team? Let’s get started!